﻿﻿﻿﻿﻿A popular bonsai plant, Texas ebony grows above forbidding tidal flats. ﻿﻿﻿﻿﻿One mercilessly hot but typical South Texas summer day, I was driving along Texas Highway 4 on my way to Boca Chica Beach. Highway 4, the southernmost highway on the Texas coast, cuts through hilly clay dunes called lomas that sit above the tidal flats in the Laguna Madre. Being so close to the Gulf of Mexico, the lomas take a regular beating from salt spray and high winds, including hurricanes coming off the Atlantic Ocean. Outside of hurricane season, it hardly ever rains on the lomas. I marveled that any plant could grow, let alone survive, in such a place. Well, Texas ebony (Ebenopsis ebano), surely one of the hardiest trees anywhere, does. The name Ebenopsis comes from ebenos, a classical Greek name for a plant in the legume family; ebano, from ancient Egyptian, means “black,” referring to the bark. Usually small trees or shrubs, Texas ebony can grow in protected areas along the Rio Grande to a height of 40 feet. ﻿Texas ebony is an important component of the South Texas brushland. The tree is distinguished by its woody pods, dense foliage, zigzag branching and fragrant flowers. Texas ebony’s dense, evergreen, shade-producing leaves make it an attractive landscape tree. The fragrant cream-colored flowers appear in the spring and are followed by thick, woody curved pods that give rise to the name “monkey’s ears.” The dense red heartwood is used to make fenceposts, cabinetry, bowls and small furniture. The branchlets, which form a zigzag pattern, are armed with pairs of wicked spines at the nodes. The bark is gray, turning dark black and rough with age. Both young and mature seeds are edible. Lore has it that ripe seeds may be roasted and ground into a substitute for coffee. Deer, javelina and small mammals eat the seeds, which are very high in crude protein. Deer favor the leaves, also high in protein. 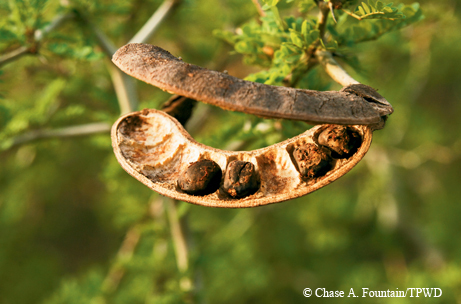 Like other legumes, Texas ebony has roots that stabilize the soil and make nitrogen, an important soil fertilizer. Texas ebony is a popular bonsai plant. Bonsai enthusiasts value its deep green leaves, woody bark and zigzag branches, which lend themselves to styles that are light, airy and graceful. The border town of Los Ebanos, where the last hand-operated ferry on the Rio Grande is located, is named for the Texas ebony. A large Texas ebony tree anchors the three-car barge on the U.S. side. Good places to see Texas ebony are Laguna Atascosa Wildlife Refuge, Bentsen-Rio Grande Valley State Park, Estero Llano Grande State Park and Brownsville’s Resaca de la Palma. Here, Texas ebony and many other tropical forest plant species found nowhere else in the United States grow at the northern limits of their ranges. These forests host many sought-after seasonally tropical birds, including chachalacas, ferruginous pygmy-owls, buff-bellied hummingbirds, green jays and blue buntings.